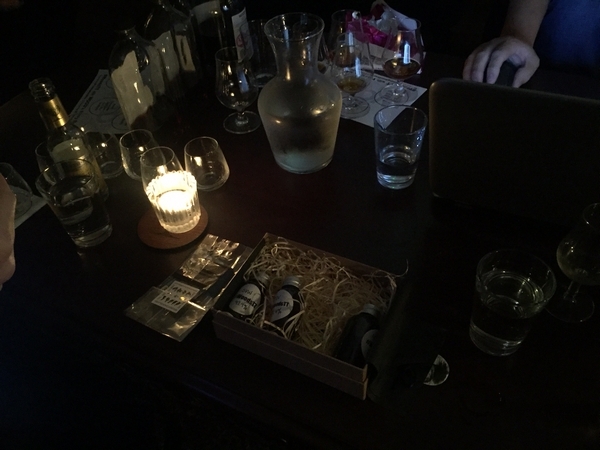 We were one of the lucky ones who got sent the Wood’s Navy rum tasting set as part of the Wood’s Navy rum Twitter tasting (#WoodsTT), which was organised by The Floating Rum Shack in collaboration with Wood’s Navy Rum brand ambassador Stephen Rutherford. As you may already know, Wood’s is not a new rum, but a fairly well established commercially available rum brand in the UK. In fact, it has been around since 1887, when the rum was first created in the docks at Liverpool. Nowadays the rum is shipped to Glasgow from the very well regarded Diamond distillery in Guyana. This rum Twitter tasting was quite different from the previous ones that we have taken part in. 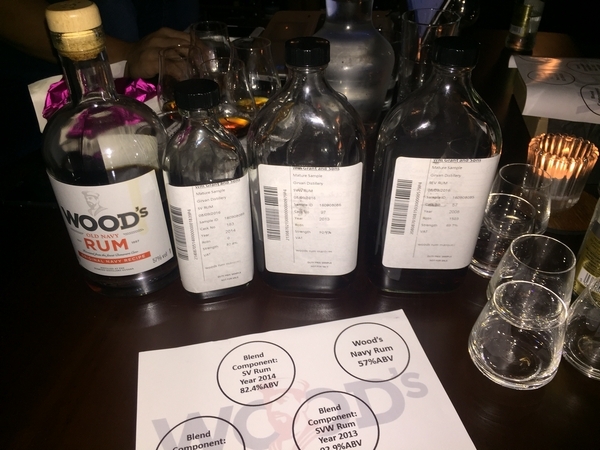 It involved the deconstruction and reconstructing of the rum’s component distillates, rather than just tasting the final blend, which was a great way to showcase the product and still make it fun and educational. 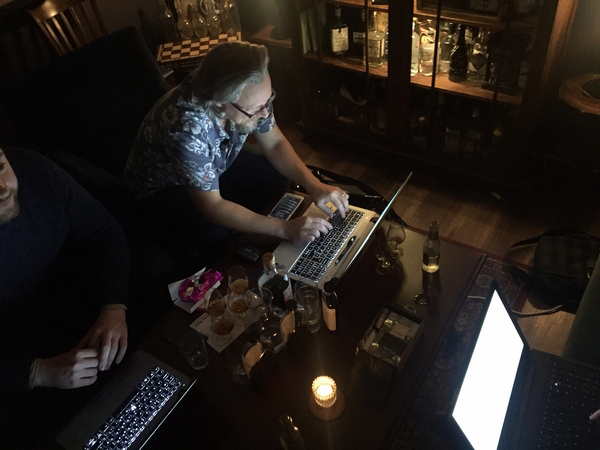 Working in Central London, we thought it would be cool to joined Pete and Stephen for the Twitter Tasting from the Merchant house, where Hebe made sure we behaved ourselves. The tasting set we received contained four “gunpowder proof” distillates, which were at 92.9% (SVW) and 82.4% (SV) from the Saville column still, the 69.7% (REV) from the only remaining wooden pot still from Guyana. These rare samples were used as part of the rum education to showcase the various flavour profiles created by Brian Kinsman, who is the master blender. The fourth and final product was of course the Wood’s Navy Rum at 57% ABV, which is a blend of both the pot and column stills. With many commercial spirits brands producing not so great “rums”, we didn’t rate Wood’s very highly (prejudices… I know). But we were glad to have found out on the might that Wood’s are one of the few brands that have real rum heritage (rather than marketing BS), as well as having kept to their traditional production method using their very unique stills. One thing that I was surprised to hear was that the Wood’s Navy rum is their only rum, which is very unusual as most rum brands tend to produce more than one. The authenticity and transparency of the brand are things that we value as rum lovers. The Twitter tasting was really hectic, we barely had time to speak to each other even though we were sitting on the opposite side of the table! There were plenty of history and a lot of questions from all #WoodsTT peeps. REV: Liquorice, pear, Woody, grassy on the nose. Apple, demerara, spice, and a bit funky on the palatte. Wood’s Navy rum: Toffee, chocolate, spice, butterscotch on the nose. Citrus, ginger and cinnamon on the palate. To end the Twitter tasting, we had some Ecuador chocolate chosen by Sam from Rococo chocolate to pair with the Wood’s Navy rum, which worked really well, and slightly intensified the flavour of rum. We would like to send our thanks to The Floating Rum Shack and Wood’s Navy Rum brand Ambassador Stephen for this great rum Twitter Tasting, and to the Merchant House for allowing us to set up camp. It was good to see the pros in action and to be in the heart of it on the night. We are now a proud owner of the newly redesigned bottle, which is quite modern and slick, and we think is definitely a big improvement from the previous older design. The rum itself hasn’t changed, which is a good thing. If you want some Navy rum history in your home, then get yourself a bottle (at the time of writing there was a promotional offer in some supermarkets where it has been reduced to around £20).